As shown in Figure 24, the top three countries/regions in the world for average connection speed in the second quarter were all found in the Asia Pacific region: South Korea, Hong Kong, and Japan. South Korea remained the clear leader despite a 2.1% quarterly decrease, but Hong Kong and Japan closed the gap with gains of 1.5% and 7.8%, respectively. Besides South Korea, the only other surveyed Asia Pacific country to see a quarterly decline was China, with a 7.1% decline to 3.4 Mbps. The remaining countries saw quarter-over-quarter gains ranging from 0.8% in New Zealand to 18% in Malaysia. Just as in the first quarter, in the second quarter, 10 of the 15 surveyed Asia Pacific countries/regions had average connection speeds above the 4 Mbps broadband threshold, and 5 of these exceeded the 10 Mbps threshold. Indonesia and India had the lowest average connection speeds among surveyed countries in the region, both at 2.4 Mbps. 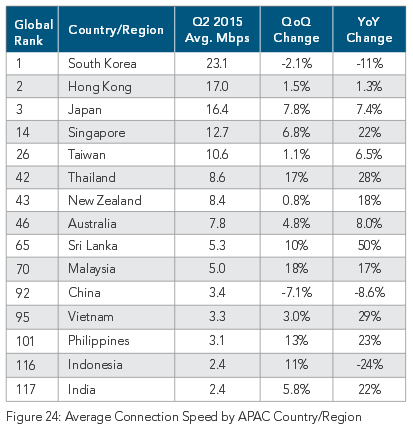 Twelve of the fifteen surveyed countries/regions in the Asia Pacific region showed year-over-year growth in observed average connection speeds in the second quarter. Hong Kong had the smallest increase at 1.3%, while Sri Lanka had the largest at 50%. Eight countries in total enjoyed double-digit quarterly growth. The three declining countries – Indonesia, South Korea, and China — had decreases of 24%, 11%, and 8.6%, respectively. 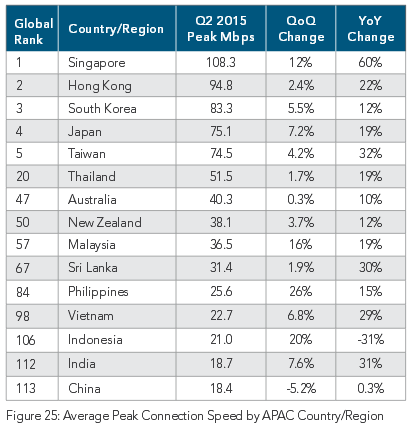 In the second quarter, the top five global leaders in average peak connection speeds were all in the Asia Pacific region, as shown in Figure 25. Top-ranked Singapore broke through the 100 Mbps threshold in the second quarter, as its average peak connection speed increased 12% over the first quarter. With the exception of China, the rest of the countries in the region all saw average peak speeds increase as well, with quarterly gains ranging from 0.3% in Australia to 26% in the Philippines. China saw a 5.2% decrease from the first quarter, pushing it down to last place among the surveyed Asia Pacific countries/regions. Year-over-year changes in the Asia Pacific region were mostly positive as well, with Indonesia posting the only loss — a 31% decline, again due mostly to a large, unexplained drop in the fourth quarter of 2014. The other 14 countries all saw yearly gains, ranging from 0.3% in China to 60% in Singapore, and five countries had yearly growth rates greater than 25%. 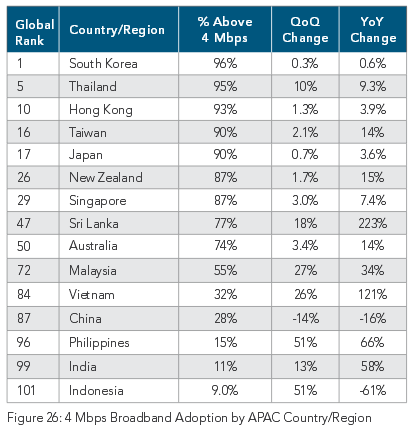 In the second quarter, South Korea once again led the Asia Pacific region in 4 Mbps broadband adoption, with 96% of its ip addresses connecting to Akamai at average connection speeds above this threshold, as shown in Figure 26. Thailand jumped from fifth place in the region to second place after a 10% quarterly increase. Seven of the surveyed Asia Pacific countries/regions enjoyed 4 Mbps broadband adoption rates of 80% or higher, while Indonesia — the lowest ranking surveyed Asia Pacific country — had an adoption rate of just 9.0%, despite an impressive 51% quarterly increase. China was the only country to see a quarterly decline; its 4 Mbps adoption rate dropped 14% from the first quarter. The remaining surveyed countries/regions posted gains ranging from 0.3% in South Korea to 51% in Indonesia and the Philippines. Seven countries in total enjoyed double-digit quarterly gains. Looking at year-over-year numbers, both Indonesia and China saw declines — of 61% and 16% respectively — while the rest of the surveyed countries/regions saw growth. South Korea had the smallest gains at 0.3%, while Vietnam and Sri Lanka posted the largest, with jumps of 121% and 223%, respectively. Although China saw 4 Mbps broadband adoption decline in the second quarter, a number of recent announcements made by its government point toward a potential reversal of this trend in the medium-to-long term. In April, Chinese Premier Li Keqiang identified the Internet as a key driver for China’s economy and introduced an “Internet Plus” plan to enable faster and cheaper broadband and mobile Internet access throughout the country. This was followed by China’s State Council announcing in May that the government had earmarked more than $180 billion to increase broadband and mobile Internet speeds over the next three years, including investing roughly $70 billion on network infrastructure in 2015. Likewise, Indonesia — the other country to see broadband adoption decline in the second quarter — had encouraging news in its quest to achieve nationwide broadband coverage, a particularly ambitious goal due to the country’s many remote islands and sparsely populated locales. In May, Indonesian satellite Internet provider BigNet announced plans to bring affordable broadband coverage across the country’s 17,000 islands starting in 2017, through a long-term partnership with Singaporean provider Kacific Broadband Satellites. Although this announcement may not have any short-term impact on Indonesia’s broadband adoption rates, it offers hope for the future.